Guess I won’t be going to Hawaii this year, after all… Just like last year I didn’t go to El Salvador; or Indo the year before that… But hey, I came close… again! 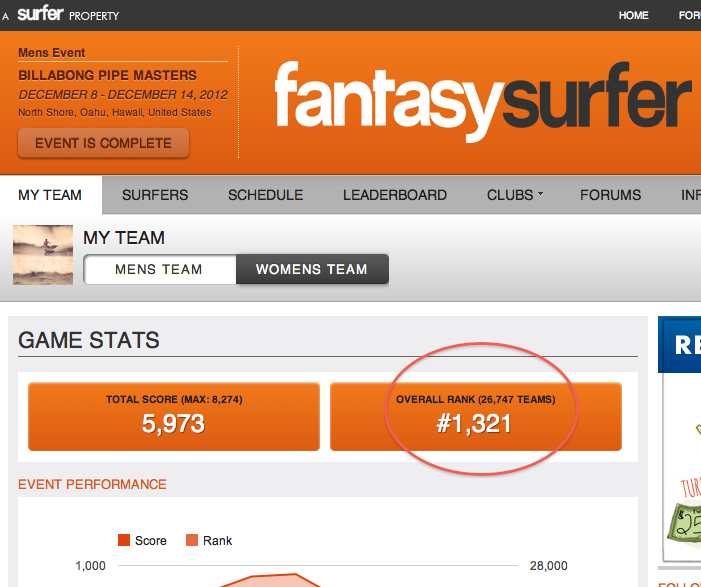 I’m referring to my fantasysurfer.com team, “Right Coast Rules”. After finishing in the Top 200 in 2010, then Top 100 in 2012, I’m back down below 1,000th place in 2012. A rough start and finish did me in this year. Still respectable though: 1,321st out of 26,747 global teams– 95th percentile! But an “A” is no substitute for an all-expenses paid Hawaiian surf-fest, which was this year’s Grand Prize. Oh well, unlike Kelly, I’m not considering retiring. Next year’s season starts in March.